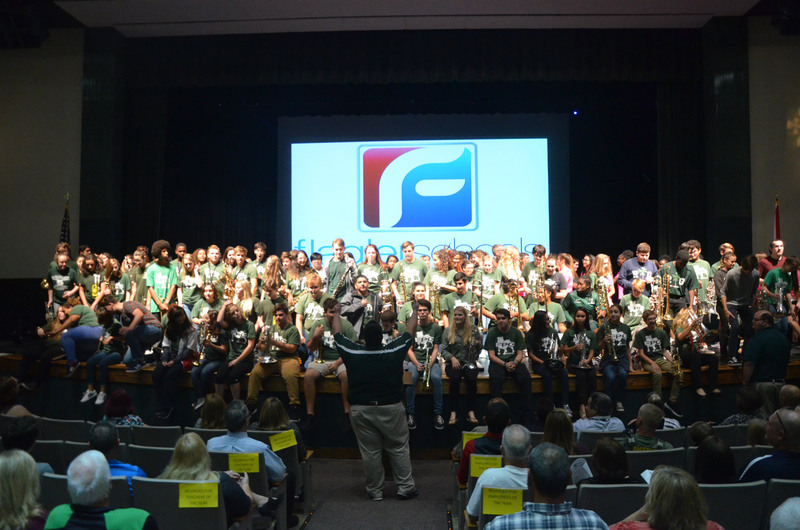 It was a night of a few hundred stars for Flagler Palm Coast High School. 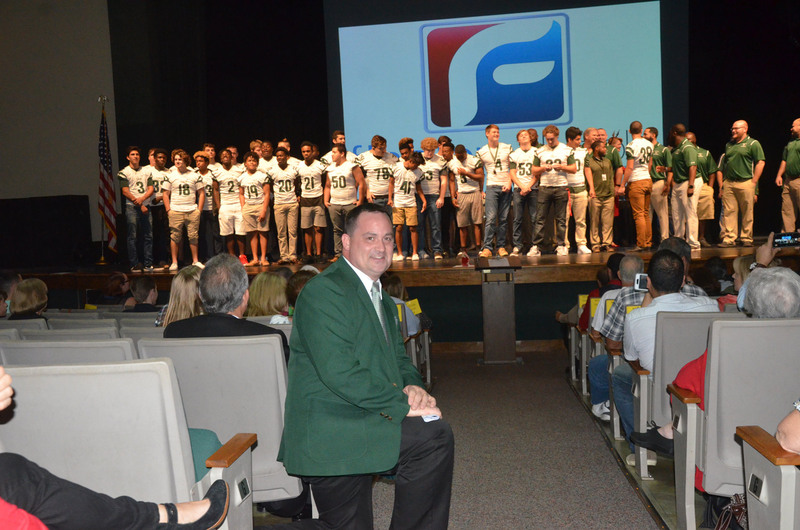 The Flagler County School Board’s last meeting of the year was also its most festive and celebratory Tuesday evening, and it had nothing to do with Christmas: The board spotlighted a series of significant and in every case historic achievements, including a first-ever undefeated regular season for the FPC football team, a first-ever run of 15 consecutive years of Superior ratings at the Florida Bandmasters State Competition for the FPC band, and a first-ever girls’ division state champion in swimming. As if that weren’t enough, the board also recognized its 2017-18 teacher and employees of the year from every school. They’ll have their own gala next month, when the county’s winners are announced. The school board meeting was moved to the Flagler Auditorium to accommodate the sort of groups that normally need a football field to fit together: the 200-member band, their instruments–some of them bigger than their performers–the dozens of players who make up the Bulldogs’ team, their parents and friends, and faculty. It’s the sort of evening that made the school board look small not just because of a stage that would make even an NBA team look small, but because the achievers all around naturally upstaged the policymakers. The policy-makers did not seem to mind one bit. Through it all, Dusty Sims, the principal at FPC, emceed the spotlights like a proud father at Christmas who was getting a whole lot more than forgettable neckties in his stocking. He almost ran out of superlatives, but not pride. “They are the most dedicated, passionate, caring and the most together group of people I have ever witnessed in my life,” he said of the band, led by Seth as director and for the past couple of years Ryan Schultz as the assistant director who’s brought new wind to the brass section. It’s not just one band, of course: there are two concert bands and two jazz bands, and this time of year “we go from one big marching band into eight smaller groups,” Seth said, though when all performers played a fight song from their seats in the auditorium, they played as one, and every atom in the place trilled. “were just very thankful to be here and to be part of this community,” Seth said. It was only then that he attempted one of his more challenging feats: fitting all 200 players on the stage for a photograph, after they shook hands with the board members. It took a while, but under Seth’s unceasing direction the wall of students slowly formed, briefly blocking out the board members and the superintendent–who’d been arrayed at a table along the length of the stage. 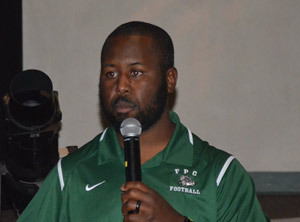 Then came the football players, after a few words from their new coach, Travis Roland, previously a defensive coordinator at a school in Volusia. Sims had asked Roland to at least have a .500 season. He turned around a team that had gone 3-6 the previous year to a perfect season for the first time. The team faltered only when it got to the playoffs, which it reached for the first time in 10 years. 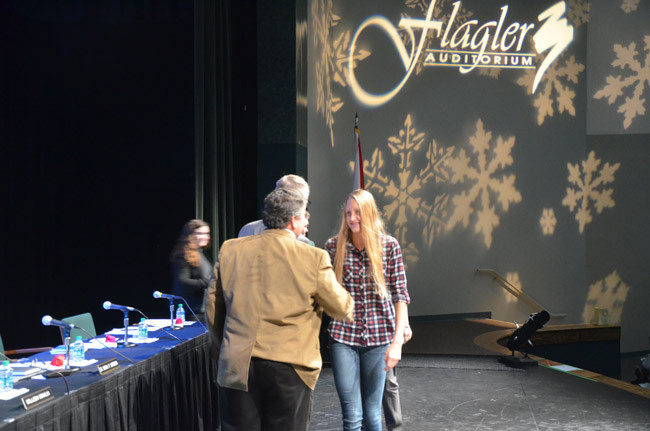 Then came Micayla Cronk, a mere ninth grader at FPC, who is the women’s Florida state champion in the 100 yard freestyle swimming competition, a first at FPC. 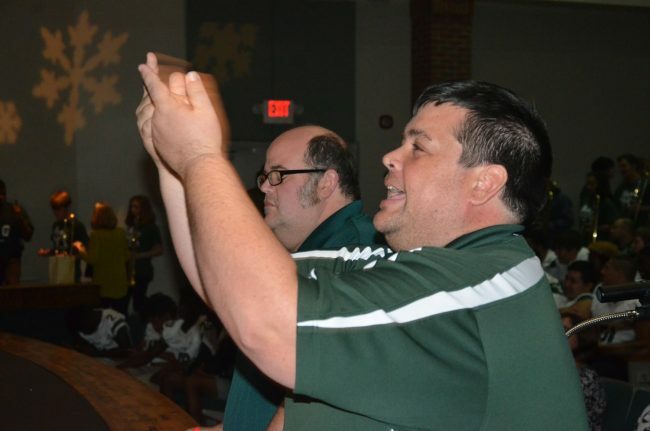 “She did this as a freshman and at the tender age of 14,” FPC’s Marie-Anne Johansson said. “Her 100 freestyle time was the fastest 100 freestyle out of four state meets. Micayla has also broken six school records this year–in the 100 free, the 50 free, the 200 free, the 500 free, the 100 back and the 100 fly,” Johansson said, using shorthand for freestyle, backstroke and butterfly. When it was all over–when the teachers and employees of the year were applauded, when the principals of Indian Trails and Buddy Taylor Middle presented their own spotlights on recent improvements, when Board member Colleen Conklin, tearing up, got a special spotlight-recognition of her own from Flagler Volunteer Services’ Suzy Gamblain and Judy Mazzella for all her work post-Hurricane Irma–and School Board Chairman Trevor Tucker invited those who didn’t want to stay for the more ponderous rest of the meeting to take leave, just about everyone filed out, the way a big crowd does at the end of a concert in a large venue. The parking lot jammed with traffic. And the school board was left facing a cavernous auditorium of 1,300 seats filled by barely enough people that could be counted on two hands, fewer if you subtracted school employees required to be there. Nothing on the rest of the agenda could be as notable, let alone as heartwarming, as what had just taken place. Huge thanks to the School Board for recognizing all of these great FPC students. The amount of time and dedication each student, teacher and coach puts in to perfecting their skills is highly admirable!